October 12, 2016 October 12, 2016 Dan O.
Everyone’s got the acting bug. Some more than others, obviously. The town of Blaine, Mo., approaches its sesquicentennial, there’s only one way to celebrate: A musical revue called “Red, White and Blaine.” And to ensure that everything goes all fine and smoothly with this musical, Corky St. Clair (Christopher Guest) is assigned the duties of director, writer, choreography and just overall boss of everything that goes on. Corky tries out a few talents but ends up settling on a bunch of excited but also, unfortunately, untalented locals (Eugene Levy, Fred Willard, Catherine O’Hara). For awhile, everything seems to be going fine – the musical-numbers are performed well and the actors themselves seem competent enough that they’ll be able to remember their lines when it’s showtime. But when Corky and the rest of the cast and crew find out that respected critic, Mort Guffman, is coming to see what the show is all about and how it’s going to go down, then everyone loses their cool and feels as if it’s time to crank the show up to 11. Everyone needs a Remains of the Day lunchbox. What’s odd about Waiting for Guffman is that it’s probably Christopher Guest’s less known, or seen feature, yet, it may also be his best. It’s not perfect, but it’s tight, hilarious, and most of all, heartfelt. See, there’s something that seems to be missing from some of Guest’s other flicks and it’s the fact that he actually does love and appreciate these characters for what weird specimens they are; he may crack jokes at their expense and enjoy making them look silly, but he also enjoys their company and loves hanging around them. And that’s why, Waiting for Guffman, despite featuring Guest’s typical jokes and gags, also seems like a tribute to the kinds of characters he likes to poke fun at and get plenty of laughs from. It’s less of a movie about the theater world and how thespians may, or may not, take their work a little too seriously, as much as it’s about these small-town, seemingly normal folks trying to make a difference in their lives, as well as the numerous lives of other people around them. Guest is a smart writer and director in that he doesn’t try and get sappy, or hammer this point away by any means, but there’s a feeling to these characters and this town that they live in that’s easy to feel a warmness from – something that’s not always so present in Guest’s other work. However, it’s still the actor’s showcase no matter what and it’s why Guest, as usual, is able to work so many wonders. Because a good portion of his movies are ad-libbed, Guest can sometimes forget when to cut a scene, or an actor’s antics, but here, he seems as if he knew exactly what to do and when to do it all. Everyone gets their chance to have fun and shine like the bright diamonds that they are, but Guest also doesn’t forget to cut things whenever necessary. Sometimes, it’s not about how much funny material you have, as much as it’s about how much of it works when cut-and-pasted next to one another; having someone go on and on about airline food is one thing, but to have a person make a line about it and keep moving on, especially when your movie is barely even 80 minutes, makes all the difference. I know this makes it sound like so much more than it actually is, but this kind of stuff and attention matters in comedy and it’s why Waiting for Guffman is one of Guest’s better flicks – a lot of the stuff that he would somehow miss the mark on in the next few films to come, he seemed to have nailed down here, which makes me wonder why mostly all of the ones to follow were, at the very least, disappointing. That said, Guest himself is quite great as Corky, playing up one of the best caricatures he’s ever had to deal with; while most of the jokes thrown around about Corky is his flamboyancy, the movie, nor Guest’s performance, comes off as homophobic. Sure, it’s funny that Corky constantly, day in and day out, still says that he’s straight, but the fact remains that Corky himself is still the brains of the operation here and without him, the play itself doesn’t go too well. In a way, the same could be said about the movie, too. Cause honestly, Corky is such a fun and lovable character, it’s hard not to miss him whenever he’s not around. Sure, the usual suspects like Levy, O’Hara, Willard, Posey and Balaban are all here to pick up the slack and still have us enjoy what it is that we’re watching, but Guest’s performance takes over the movie so much that whenever he’s absent, it’s hard not to think of where he’s at, or what he’s doing. Guest is obviously behind the camera, doing what he does best, but what about Corky? Sometimes, it’s best to just give us more of a character who is stealing the show to begin with. Maybe it’s not always the case with every great character, but it seems like it would have been perfectly fine for Corky. 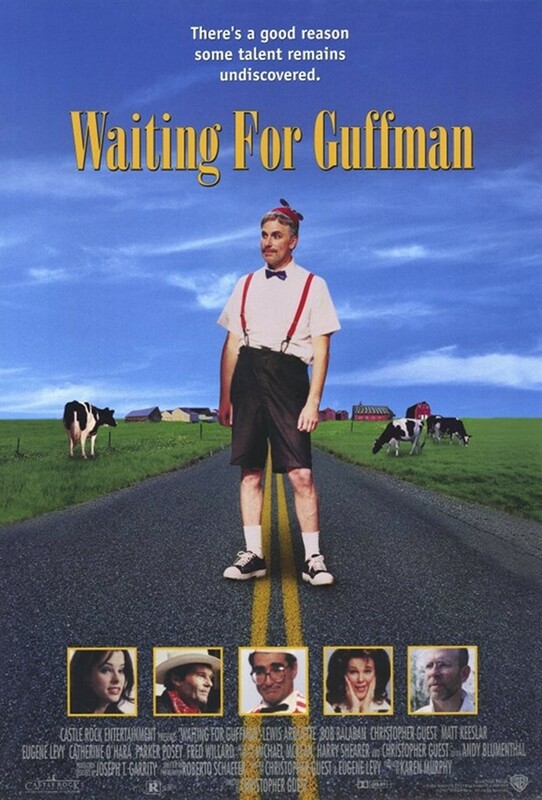 Consensus: Funny, smart, quick, and a little touching, Waiting for Guffman is one of Guest’s better flicks that shows just what he can do when he’s thinking on his feet and is still capable of editing his material to perfection. Somehow, it’s not embarrassing. Or at least, not as embarrassing as some high school plays I’ve seen have been. Canada’s celebrating our sesquicentennial next year – I’ll be thinking of this film a lot! I love this movie. It’s one of the finest mockumentaries of all-time. I agree, it’s as much about the people and their tight-knit community as it is about the theater. They pull it off, marvelously. Great review.